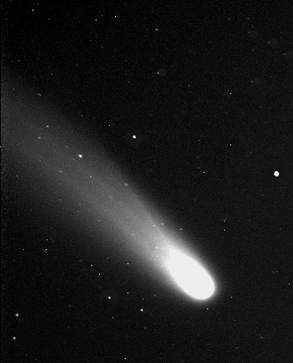 Comet Ikeya-Zhang on the evening of Thursday, March 22, 2002, pictured by the MicroObservatory telescope in Cambridge, Mass. The MicroObservatory project, created by the Science Education group at the Harvard-Smithsonian Center for Astrophysics, allows students and teachers across the nation to use telescopes over the Internet to take pictures of objects in the night sky. Image: Harvard-Smithsonian Center for Astrophysics. The brightest comet since 1997's Hale-Bopp is currently gracing the western skies of North America. Comet Ikeya-Zhang (pronounced "ee-KAY-uh JONG") was discovered on February 1st by two amateur astronomers in Japan and China, respectively. Calculations of the comet's orbit by Brian Marsden of the Harvard-Smithsonian Center for Astrophysics show that it was last seen in 1661. This makes Ikeya-Zhang the first long-period comet (a comet with a period longer than 200 years) to be identified on its return to the inner solar system. No telescope is necessary to look at this beautiful visitor as it swings around the Sun and heads back to deep space. The comet has brightened to naked-eye visibility, but is easiest to see through binoculars. A casual glance will show the bright, starlike nucleus surrounded by a fuzzy cloud of dust and gas called the coma. The comet's tail streaks away from the Sun, pointing nearly straight up from the horizon. To find Comet Ikeya-Zhang, look in the western sky shortly after sunset. A red point of light about 18 degrees up in the sky is the planet Mars. (An outspread hand at arm's length covers about 15 degrees, so Mars is a bit higher than one hand-span.) To the right of Mars are two bright stars in a nearly vertical line. The comet is at the same height as Mars, to the right of the two bright stars about as far again as the distance from Mars to the stars.